It sounds that if you the pics and a list of participants and their name then you could tag the pic with their last name and then if someone searched your site by the last name you would be violating the patent. Just in half interested bystander. The participants would need to be wearing signs with their last names. It would have to be a sporting event. Disclaimer: I am not a patent attorney. I'm having difficulty parsing that sentence. I can't figure out exactly what you're trying to ask. And man do I need to stop posting at that hour... just re-read my own post and oi! is that scatterbrained and muddled. No. You only need a way to associate the identifying data (their last name) with the image. You could walk around a head of time and learn everyone's name in person and then later go through the pictures and key in their names, or any system you wish... it's the act of associateing the identifying data with the image that matters, not how you do it. 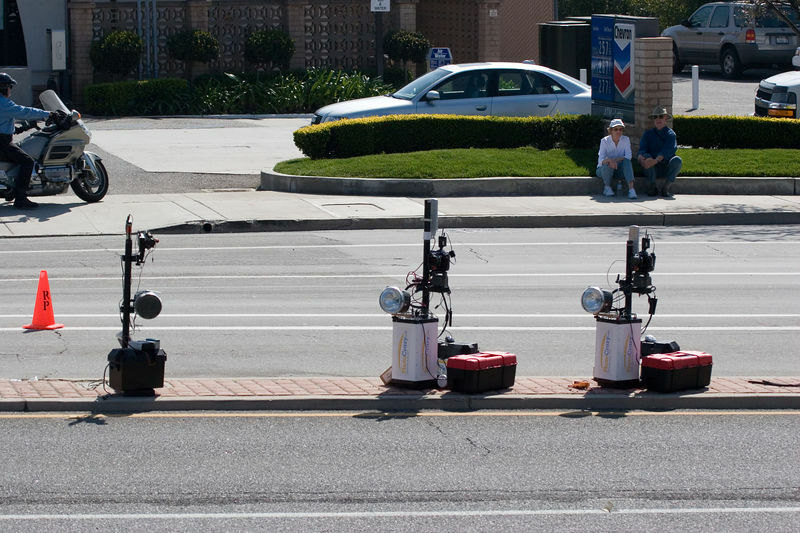 I was shooting the Amgen tour, where I met a pro photog with a very sophisticated setup. Motion sensors triggering the lights and cameras.. He said he took a thousand of pictures during a couple of minutes while the pack was flying around the corner we were set up, all automatically. I spoke to him afterwards, I mentioned the smugmug, and he asked me if I had a license. I said "what license, it's a public event and a public place". He said that there is a patent pending, and referred me to his own site FAQ. Process for providing event photographs for inspection, selection and distribution via a computer network. Filed in August 17, 2000. I didn't read all the fine print, but from what I read and understood, anybody who's taking picture at any event and then use any kind of a digital process and any computer network in between is in violation of this patent.. But I have a gut feeling that this patent is too broad to not affect anybody who's trying to make some money off *any* public event photography and then use smugmug, pbase, ofoto or *any* other website (including personal ones) to run some business. What do you guys think? Those of you who actually run your business off your own website or off the smugmug-based one - are you "covered" by that patent? Did you get a license;-)? Do you care? Baldy, OneThumb, Andy - have you heard of this? What's your (or, shall I say, smugmug's) take on it? I've merged these two threads, so your post, Nik is now in the thread that was started earlier. I was so worried after meeting and talking to this guy in person (he lives same city as me and davidTO, as it turned out), that I rushed to post without checking the history first, for which I apologize. David, appreciate your friendly help! It looks like I was dealing with a "legend" and didn't know it. And I was dumb enough to give this guy my business card (that was before he mentioned licensing:-), so I guess I will receive "cease and desist" letter from him on the next week or so. Now I understand what we was saying about that I need a license. I need a license from him!!! Actually, if I remember correctly, you standing on the side of the street snapping photos and manually identifying the participants and selling them photos (even from a web site) would not violate his patent. His patent is based on the automation of the entire process (timing, etc.) to identify participants without relying on purely visual processes. But then again, I'm not a lawyer. I don't even play one on TV. Oky Doky.............I have looked at this patent, and truly believe a first year law student could eliminate 90% of it. It's shear nonsense! I did go to this guys photo event site, and from what I saw his only hope of making any money in photography is to bully the unsuspecting, and gullible into paying some outrageous license fee. I don't do, or have any thoughts of photographing any events for money, but if I do, I will not hesitate to post the photos for sale, or viewing online. Actually I think he is claiming any distribution at all on the internet, even if no money is involved is a violation of his not very original idea to offer photos on the internet. Please let us know if he sends you a cease and desist order. I would be very interested to see the exact wording. Oh and how about a look at one of the photos you took at the event? I love it. I realize it's the onion, but I think this is simliar. Microsoft Patents the Base 2 Numbering System. Oh - I think I'll Patent the Base 10 system. I'll bet nobody has applied for a patent on that one. Then anytime that anybody uses real numbers for any type of production or commercial use then I can claim the money. I'm considering using that analogy to submit a patent of my own. I'll propose to take pictures, Then modify the pictures with a watermark, and provide a cool interface to display the pictures using stylesheets. Then the users will have the option of buying a variety of products based on the watermarked pictures. There - One Thumb - Now Smugmug will be the only ones who can post watermarked photos for preview or purchase over the internet. Their page format is seriously lacking. Even the Basic account in smugmug (without customization) looks better then their crap. Looks like a site from the late 90's. White backgoround, with a couple forms, and a couple half act pictures. This has got to be a joke, they can't seriously be claiming this. I looked at his website, pictures shot at the same spot at the same time I was there (Amgen Nike Race 25 Feb). Well, considering he had 4 cameras set at fixed angle, all the settings on manual, triggered with his sensors and prolly in jpeg mode - no wonder he got way more pictures than I did all by me lonesome. Are they better? They might be, but it's *really* hard to say. With all his patents it's really hard to see the level of the details on those tiny thumbnails. Would I buy my own picture from there? I highly doubt it..
Also there is a link to the gallery. Thanks for the fresh look! Someone's got a site covering the latest on this issue. Good info Mike! I am glad to see there are groups that have the resourses looking into this crap. If common sense were able to rule we wouldn't need half, well ok, 85% of the lawyers we have, and armed conflict around the world would come to a halt. Nice dream, but it ain't happening in the real world. It doesn't say automated process, it just says process. To me, that means that the process could be a human looking at photos, matching jersey or bib numbers with a team roster or other printed reference list, and typing the athlete's name into the photo's EXIF data. The summary is written to imply automation, talking about "a particularly preferred form of the invention, an active or passive component is worn by the event participant" and that "camera can be triggered automatically when the component passes a sensor," but if I understand correctly the summary's not what gets brought up in court - the claims are. I went and took another look at what this inept photographer / buisiness wanabe calls a website. I can't believe my eyes! I saw photo after photo of cars, motorcylels, emergency vehicles, city trucks, and oh yeah a couple of bicycles. The photos are so small I can't judge the quality at all. If he sells one photo I will be amazed. But there lies the rub. He isn't interested in selling photos. His business model is to force other to pay him to take photos. Be aware he has other patents pending. I think one of them is a patent on light. So if you capture, or use light in any way, you will need to be licensed. My plan is to take whatever photos I want and share them with whoever I want. Well, to be totally honest, it's more than a couple:-). I went through in a 5x4 mode and counted 11 or 12 pages filled mostly with bikeriders photos. Which, in turn, gives about 220..240 pictures taken during those 20 seconds. Split between 4 cameras, it gives essentially 2..3 fps. Other than that - yeah, I kinda get relaxed about him living next to me. I read what others said about his "business model", I'm not involved and hopefully will not be. So, essentially, "I'm sticking with your plan"
At least some serious folks are looking into this, because all my persolnal photo-initiated proceedings would not cover even two hours of a good patent attorney.. I looked at his site, and he offers a low-paid job for people to look at the pictures and try to identify the participants in them. However, it was not "C&D" we were talking about . I looked at that website and the forums where this is being discussed. I don't understand the one forum totally closing the thread and not allowing discussion on this topic. I think it's very important for photograhers to be aware of the legal implications in the business be it copywright, invasion of privacy or supposed patent infringement. I understand correctly the summary's not what gets brought up in court - the claims are. Correct. Only the claims matter... everything else is "educational" to help explain the claims and put them in context. But only the claims are protected, if something isn't spelled out in the claims, then it's not afforded patent protection. I hope you do go and talk to him. It would be interesting to hear exactly in his own words what he laying claim to. As an example, if he is only laying claim to the auotmated photo taking and customer search by time, he might have a valid point, but if it's anywhere near what I have read, "the taking of any event photos and offering them via the internet" then that's waco. I would counsel against taking a tape recorder. Legal issues aside, just approch him staight up, and talk. You, we may not agree with his stance, but we can learn more about the person, clarify his position , and see where he is comming from. If he's nuts, so be it, but there is nothing to gain by tape recording him. This is just a conversation. Guys - let's keep this debate civil - without disparaging this fellow in any way at all, OK?? Some of you have already crossed that line. Personal attacks are wrong, period. I wonder if he is going to take this internationally? The Olympics just ended. I wonder how many infringement cases occured there? How about photo finish cameras? Horse racing and NASCAR are using them. NASCAR is even using telemetry tied to the camera to determine who is being photographed. Or is he only claiming the sale online part? And the best for last.... I got hit with a speeding ticket from DC metro police. A vehicle with similar tags to mine was photographed speeding. From what I can tell from my research, a camera was placed near a road. 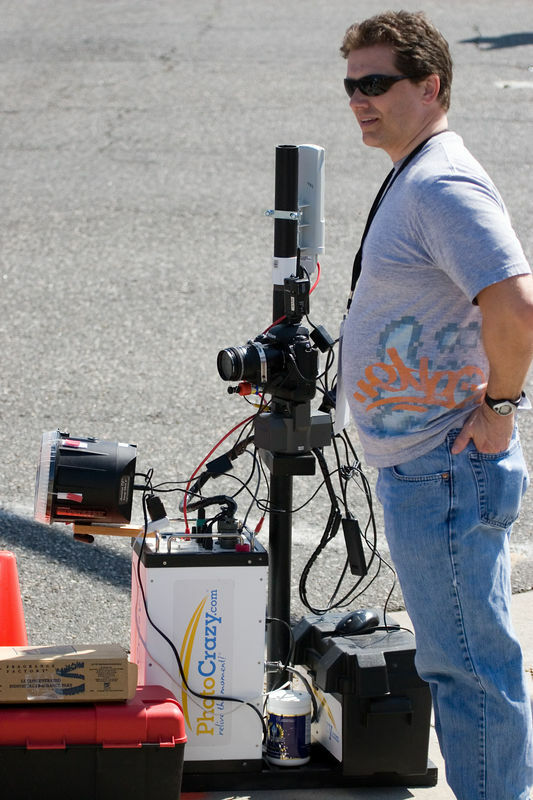 The camera uses speed and timing devices to determine speed of the vehicle and trigger the photo. Photo interpretation software reads the license tag. That information is posted on a website for collection of fines. A letter is mailed to the owner of record directing them to go to that site and pay the fine. Luckily I was able to prove that the software was incorrect and the QA person did not do their job. Elements of this sound really familiar.??? I do not photograph races so I am not as worried as some of you are. But the part about online sales does bother me.